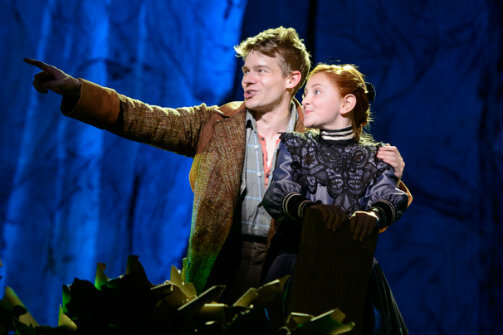 Andrew Keenan-Bolger and Sarah Charles Lewis in Tuck Everlasting. Photo by Greg Mooney. BOTTOM LINE: Tuck Everlasting is an imaginative and faithful adaptation of Natalie Babbitt's timeless children's novel that successfully leaves the audience pondering: if you could live forever, would you? Casey Nicholow is having a bit of a moment: Tuck Everlasting, the new musical based on Natalie Babbitt's wondrous children's book, marks the director-choreographer's fourth musical currently playing on the Great White Way (the others include The Book of Mormon, Something Rotten, and Aladdin). Nicholow shows no tiredness: his current Broadway endeavor—the first featuring a child or a female as its protagonist—is just as inspired. Tuck Everlasting's reflections on mortality, fantasy, and the stuff that keeps us young—not just enchanted water—lends itself perfectly to musical material, and Nicholow certainly capitalizes on these juices even if Chris Miller and Nathan Tysen's score only features a few stand-out songs or melodies. But first, the story (a staple in grammar school since its 1975 publishing). The Tuck family—Mae (Carolee Carmello), her husband Angus (Michael Park), and sons Miles (Robert Lenzi) and Jesse (Andrew Keenan-Bolger)—has found a magic spring granting them eternal life. To keep their secret, the Tucks separate and then reunite every ten years—the time needed to forget a face, as Mae says. Pursued by the Man in the Yellow Suit (a delightfully sinister Terrance Mann), the Tucks' vagabond antics work until a young girl encounters Jesse drinking from the spring in the wood. That young girl is Winnie Foster: fatherless, adventurous, and on the brink of womanhood. Played by apt newcomer Sarah Charles Lewis with a mix of zeal and innocence, Winnie creates an easy gateway into the mysterious and beguiling world of the Tucks. Still in mourning for the loss of her father and imaginatively stifled in her mother's house, Winnie runs into the wood, designed with storybook charm by Walt Spangler, to celebrate a life that seems to perfectly coalesce with the Tucks' carefree spirits. Except that immortality comes with its difficulties: Miles' wife and child did not drink from the magic spring and so went on to die, Mae and Angus are perpetually stuck in waning middle-aged romance, and Jesse is new to manhood with no one to share his secret or be intimate with. That is, until Jesse meets Winnie. Naturally, Jesse wants Winnie to join him in immortality, as beautifully outlined in the Act I closer "Seventeen." While Jesse's wish could easily be seen as lewd, Keenan-Bolger instills his character with endearment and yearning, so much so that the seed is planted for Winnie to learn the emptiness that comes with eternal youth. These longings are often effectively communicated in Miller and Tysen's score, which blends folksy tunes with musical theater pizazz, the genres often shifting to mirror characters' personalities. (The score dips into the latter category in an Act II highlight where stage legend Fred Applegate, as the town's good-willed but dull-witted constable, revels in a cakewalk number about his life in crime-fighting.) The more poignant numbers belong to the Tucks, who one by one try to get Winnie to see past their seemingly perfect facade. Mae, Miles, and Agnes each reflect on their youth through wistful numbers, though Jesse is the last to accept Winnie's decision to live as a mortal, with his surrender coming at Tuck Everlasting's balletic climax, a nonverbal finale so enchanting the only sounds heard over the fluttering of feet and the swells of the orchestra were the creaks of seats as patrons collectively leaned in to find more wonder, more dance, more life. Nicholow's stirring finale is not just highly functional as the epilogue to Tuck Everlasting; it is an ode to Broadway past: where dance played a more vital role, where a dream ballet communicated more than words, where movement more generously informed character. In this dance, we see Winnie age, get married, have children, grow old, and, of course, pass away. All the while we see the members of her family age and pass as well, as the Tucks remain stuck in time while the dance of life's seasons and cycles spins onward. Tuck Everlasting is written by by Claudia Shear and Tim Federle, with music by Chris Miller, and lyrics by Nathan Tysen. Based on the novel Tuck Everlasting by Natalie Babbitt. Directed and choreographed by Casey Nicholow. Scenic Design by Walt Spangler. Costume deisng by Gregg Barnes. Lighting Design by Kenneth Posner. Sound Design by Brian Ronan. Hair Design by Josh Marquette. Makeup Design by Milagros Medina-Cerdeira. Production Stage Manager is Holly R. Coombs. The cast is Carolee Carmello, Andrew Keenan-Bolger, Sarah Charles Lewis, Michael Park, Terrence Mann, Fred Applegate, Robert Lenzi, Michael Wartella, Valerie Wright, Pippa Pearthree, Timothy J. Alex, Jonathan Burke, Callie Carter, Chloe Campbell, Benjamin Cook, Elizabeth Crawford, Deanna Doyle, Brandon Espinoza, Lisa Gajda, Christopher Gurr, Neil Haskell, Matt Meigs, Heather Parcells, Justin Patterson, Marco Schittone,Brooklyn Shuck, Jennifer Smith, and Kathy Voytko.